Etherpad is a free writing tool, which allows you and your students to work simultaneously in a simple text document. EtherPad is reminiscent of Google Docs, but it requires no login, and is therefore easier to start using. On the other hand the editing options are not quite as good, and there is no access to eg spreadsheets, questionnaires and presentations. The tool is suitable primarily for use within the polyphonic form of teaching. Within the polyphonic form of teaching EtherPad is a good tool for the students' project work, where students must collaborate in groups. By having students work in Etherpad, you can continuously follow the teaching process – it just requires that you know the URL of the pupils ' joint document. Students can also use Etherpad to write simultaneously on the same document, although they do not sit together, and they have the opportunity to chat with each other. If the teacher creates a document and displays it on the projector, Etherpad can also be used as a shared whiteboard, where students can write simultaneously. Each student gets her own color as shown in the image above, and she can enter her name in the upper right corner, and get an overview of who wrote what. Etherpad is an Open Source project, and you can download the software and install it on your own server. However, it is also possible to create documents on one of the many servers that are already running Etherpad. You can find a list here. Once you have selected a server, you can create a document, either by clicking ' New Pad ' or by entering an optional name on document. 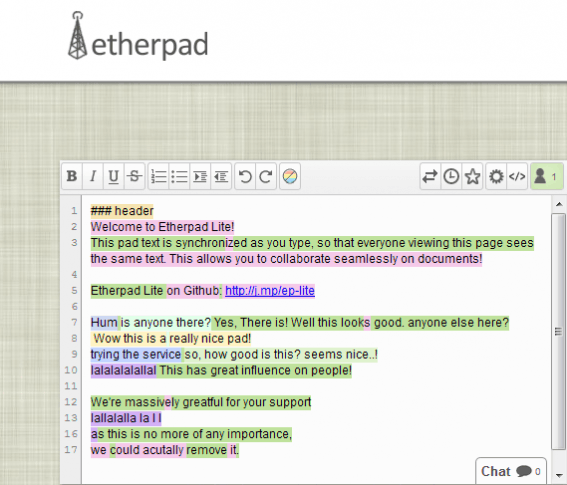 Etherpad is free to use, and it works best in the Google Chrome browser.